Wright’s Lake offers many different avenues to recreation with camping, non-motorized boating, and many many hiking trails. Rockbound trail is the easiest way into the western side of Desolation Wilderness, although it gets steep getting there. The Red Peak Stock trail from Willow Flat offers a more remote and primitive trail for more experienced hikers who enjoy the challenge of following a fainter, less traveled way. Wright’s Lake is surrounded by small and isolated cirque lakes, many with trails leading to them. Directions: Simply go east on Highway 50 to the Wright’s Lake turnoff at 36 miles, take the paved road for 8 miles to the wilderness parking lot, or the Twin lakes trailhead, which goes R and through the camping area (see map). Trails go in all directions from the Wright’s Lake area to many small lakes. The Barrett jeep trail heads north to Barrett Lake, just outside the wilderness. There’s a seldom used western trail that leads over to the Van Vleck area via the Two Peaks trail. And a southern trail to Blood Sucker Lake that ties into the Lyons Creek trail. 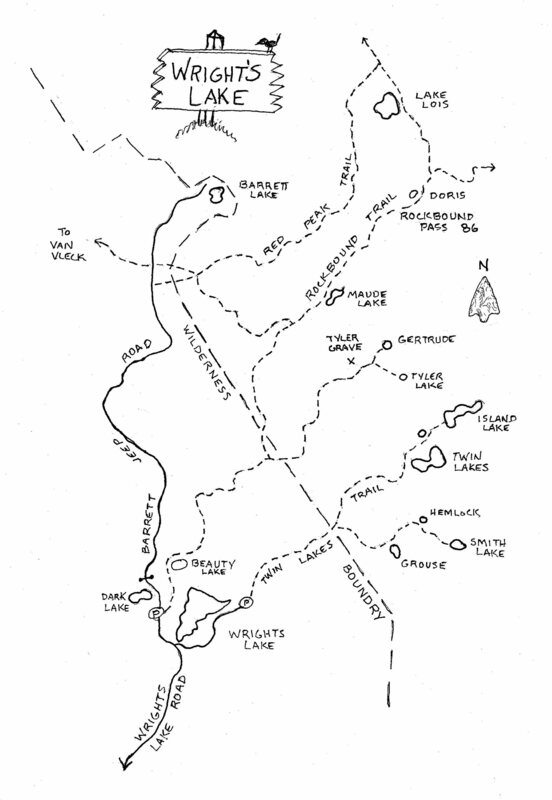 History: Wright’s Lake was a popular Indian destination for the Washoe Indians of Lake Tahoe. The pristine meadows were ideal growing sites for many of the natives favorite foods: Bulbs, berries, acorns, and wildlife. The area gets its name from Ed and Bert Wright, brothers, who saw the potential for a lucrative dairy operation in this high pasture-land and they each filed for 640 acres. At that time the new Johnson’s Road had opened up between Placerville and Virginia City, just in time for the stampede of California miners for the rich Comstock Lode of Nevada, 1859.